They say a picture is worth a thousand words. In this case, however, the picture does not tell the full story. What these pictures do not show is my husband, hanging over my shoulder the entire time, wondering when I was going to put the darn camera down and let him at the ribs! 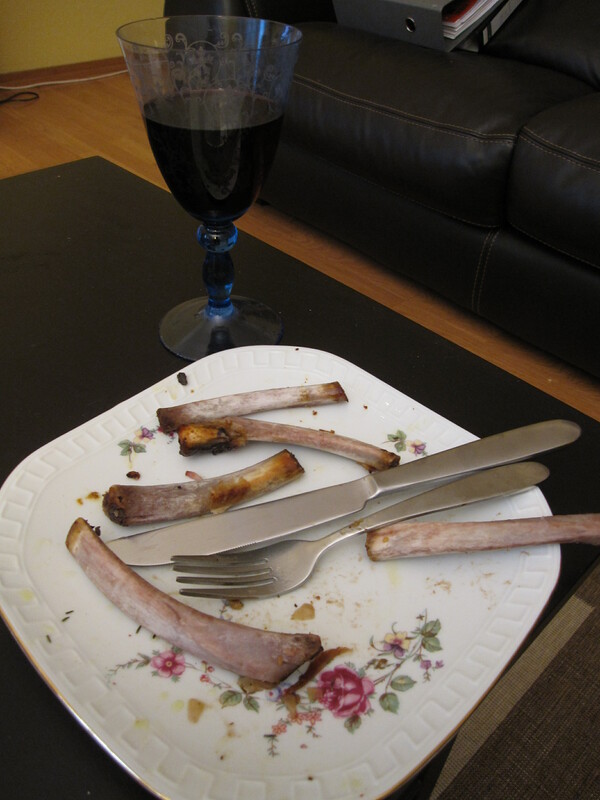 Needless to say, he was very excited about this week’s French Fridays with Dorie recipe, Cola & Jam Spareribs. This week was a first for me; first time ever cooking ribs and first time ever cooking with Coke. And I have to admit that I was a bit skeptical on both points. First, my father is justifiably famous in our family for making amazingly good ribs, which he smokes for hours on end in his outdoor smoker. Therefore, I had this idea in my head that one simply could not make decent ribs without a smoker. And second, I am not a big soda drinker and cooking with Coke just sounded plain weird. Dorie’s recipe calls for the ribs to be marinated in a dry spice rub, then slathered in cola & jam and roasted in the oven for a few hours. The one slight deviation we made from Dorie’s recipe was to use mirabelle jam instead of apricot, simply because we happened to already have a jar of it in the fridge. Otherwise we followed her instructions to the letter. The end result was, well, delicious! The ribs were juicy and tender. I can’t say that the specific flavors of the spices and cola comes through, but they mixed together to give the ribs a tasty but subtle seasoning. I still think that my dad’s smoked ribs are superior, but for those of us who do not own smokers, this recipe is a keeper! And what did my husband think? I’ll let the picture of his polished plate speak for itself. 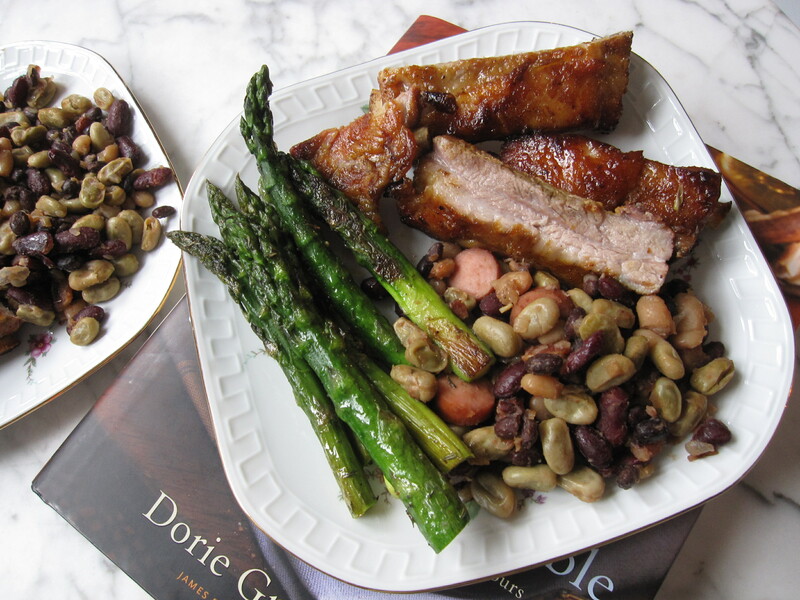 This entry was posted in french fridays with dorie and tagged Around my French Table, main course, pork. Bookmark the permalink. Too funny, I think I was checking out your blog at the exact same time you left a comment on mine. I would love to say that I was looking at your ribs post, but I got distracted instead by those yummy looking watermelon cupcakes! 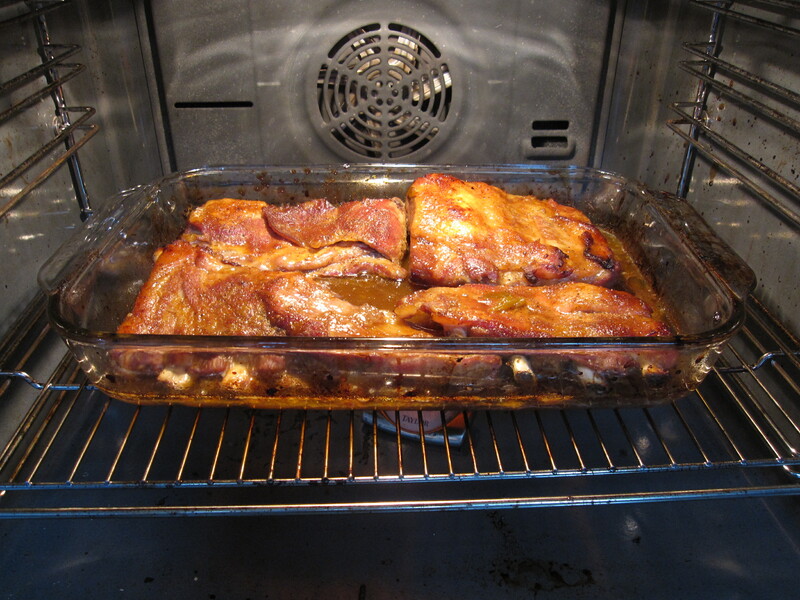 I was also concerned about the cooking with Coke element of this recipe, but it turned out not to contribute much flavor/sugar, and just seemed to help the ribs darken. Yum. Love the last picture. My husband always gets antsy while I’m trying to take pictures of food, too. I’m jealous of your Dad’s smoked ribs! I love your selection of side dishes too. The mirabelle jam sounds like a lovely substitution. Dad’s ribs are amazing! Maybe one day we’ll have a smoker and a back yard to put it in, but for now these ribs hit the spot. Great post! I love the description of your husband, too! We were so ready to eat these because they smelled so good cooking! Very nice post and your ribs look wonderful! This is my first time here, you have a very nice blog. I will be adding you to my google reader. Loved your last photo! Have a nice week-end! Too funny. I certainly can understand the impatient eaters waiting while I get the photos done. A lot of eye rolling usually happens around that time! I like your last photo…ribs are kinda ugly and don’t really photograph well…so those bones tell the story well. I also thought the flavors were a little weak. Nice post. Thank you. It’s funny, I didn’t actually plan to take a picture of the bones, but he had polished them so clean that I just thought it was a cute picture. And in the end, it turned out to be the best one. My partner was impatiently waiting for these, too. We had to negotiate so that he didn’t finish the batch in one sitting! He told me he’d go get ingredients for these any time. I’m glad your husband enjoyed them, too. Ha! Great photos! (And I know that isn’t easy to do with ribs!) I am under orders to make them again so there you go. I guess they were good. I wish I thought to take a photo of the bones like that! It would have been easier as the ribs were moving too fast off the platter! Your ribs look great! I love how you featured Dorie’s book in your photo! Wow! Good job with the knife and fork! Totally makes me want to practice…maybe not on this recipe still not my favorite, but it might give me a good reason to make more lamb!